The two complementary research institutions – EMBL being a centre for basic research in biology, and the Medical Faculty of the University of Heidelberg a research hospital – will continue to share data and resources. Together, they aim to achieve scientific and medical breakthroughs that each individually may not have been able to make. This kind of close collaboration really bridges the gap between basic and medical research. One example is a research group focused on cystic fibrosis, led by an unusual but forward-thinking partnership between pediatrician Marcus Mall and chemist Carsten Schultz. 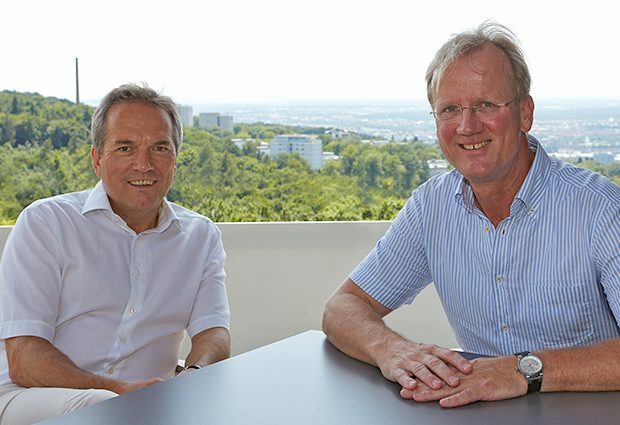 Mall, Director of the Department of Translational Pulmonology at the University of Heidelberg, developed a mouse model for cystic fibrosis, while Schultz, Senior Scientist at EMBL, created chemical fluorophores that bind to the proteases causing lung inflammation, thus allowing the biologists to visually follow the evolution of the disease. Together they were able to pinpoint which proteases were driving the inflammation and would be efficient targets for future treatments in mice but also, further down the line, in humans. We also want the partnership to tackle more transversal issues that are crucial for biomedical research in general. The study of genes’ and proteins’ sequences, and their interactions, generates such vast amounts of data that scientists in all fields are faced with the problem of analyzing, storing and sharing their immense wealth of information. In addition, data related to humans, patients or donors, need to be kept confidential, thus adding another layer of complexity. In the coming years, the MMPU has already started, and will continue, to work closely with EMBL-EBI, where the biggest European biological databases are hosted, to develop a safe environment to serve the interests of both donors and basic and clinical researchers. These data have already changed how we see translational research: increasingly, data from patients will inform basic science, which will then test hypotheses in model systems and translate insights back to the clinic. “This will probably be the biggest and most exciting challenge for the MMPU until 2025, and maybe beyond,” Hentze and Kulozik agree.